I recently had two kayaking experiences in the country of Belize. Belize is an interesting country in Central America. I had gone to Belize many years ago on a mission trip to the interior cities of Corozal Town and San Ignacio. But this trip was to the barrier island of San Pedro with its outer barrier reef. After getting to the coastal city of Belize City, Tropic Airline delivers tourist to the outer resort areas. Rose Mary and I flew the Tropic "puddle jumper" to the city of San Pedro on the island of the same name. This island is narrow, only a few hundred yards wide and at just above sea level. After meeting our resort host we walked an alley two blocks to the boat pier as our luggage was taxied around to the boat. Then a seven minute boat ride took us up the island to our resort, El Pescador (The Fisherman). English is the language of Belize as it was previously British Honduras. El Pescador is an Orvis endorsed resort specializing in the "Grand Slam" of catching a tarpon, permit and bonefish using a fly rod on the same outing. This accomplishment is very difficult and doesn’t happen very often. Of the 15-20 fishers each day at our resort, in the five days we were there, only one grand slam happened. Bonefish are plentiful and easier to catch, but the tarpon and permit are difficult. This is about kayaking so I will write about my attempt at a grand slam later. I planned to fish two days with a guide and play with Rose Mary the other days. The El Pescador plan we were on was inclusive with bicycles, kayaks and swimming pools available. The barrier reef runs parallel to the island and is out about ? mile. There is a buoy anchored on the reef so you will be able to tie up your boat as you snorkel the reef. Well, Rose Mary and I headed for the wrong buoy and after being redirected by a resort motor boater we final made the trek to the buoy at the reef. It is shallow enough to stand at the buoy so we donned our snorkel equipment and swam over the coral reef with all it associated wildlife. Tropical fish were plentiful and we enjoyed our independent snorkeling adventure. 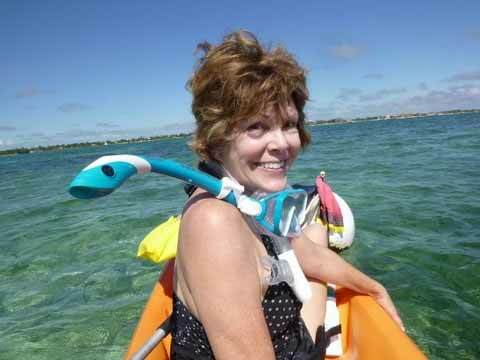 Kayaking the reef is a very easy, inexpensive way to enjoy snorkeling. We used a tandem Ocean kayak and the only problem was paddling together. You’d think after 39 years of marriage, paddling a kayak together would be natural, but it wasn’t. We did get to the reef and back but not without difficulty. In photo recording all my kayaking and fishing adventures I have water fried three cameras. I finally realized they make a waterproof camera for less money than any of the cameras I destroyed. For this trip all my water pictures were taken with a waterproof Lumix DMC-TS25. I didn’t have the confidence to do underwater, saltwater pictures but its manual says it is possible. 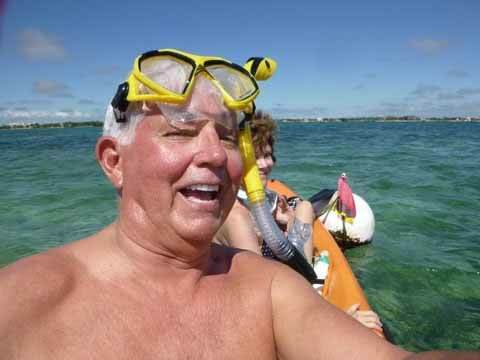 So pictured is Rosie and me doing "selfie" pictures at the barrier reef off San Pedro, Belize.